Okanogan Pasture Pigs—we specialize in small farmstead pigs bred to do well on pasture (with minimal rooting), great temperaments and the cutest faces! 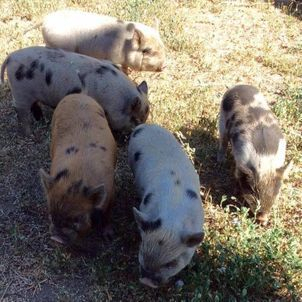 Okanogan Pasture Pigs will have ¾ Kune Kune x ¼ American Guinea Hog piglets available this summer. They will be well-socialized and current on their vaccinations before leaving our farm. These are pasture pigs (they are made for grazing and are slow-growing). The sire is double wattled, nice face, super furry. Sow is a little less typey, no wattles but small size. Both are super friendly. We should have all kinds of colors with this litter--the last few have had gingers, black/whites, black/white/browns and an (almost) solid white. Some babies may have a wattle (or two). Located in Okanogan but can deliver for an additional fee. 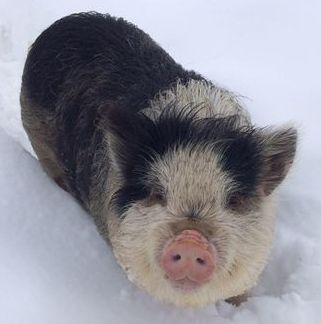 We will consider trades for a farm dog (Border collie cross) or LGD cross....or will trade two piglets and ADD money for a registered Kune Kune gilt (ginger and double-wattled). E-mail me to get on my list or follow me on Facebook @Okanogan Pasture Pigs.